University of Chicago Press, 9780226922683, 192pp. In 1972, philosopher of science Thomas Kuhn threw an ashtray at Errol Morris. This book is the result. At the time, Morris was a graduate student. Now we know him as one of the most celebrated and restlessly probing filmmakers of our time, the creator of such classics of documentary investigation as The Thin Blue Line and The Fog of War. Kuhn, meanwhile, was—and, posthumously, remains—a star in his field, the author of The Structure of Scientific Revolutions, a landmark book that has sold well over a million copies and introduced the concept of “paradigm shifts” to the larger culture. And Morris thought the idea was bunk. 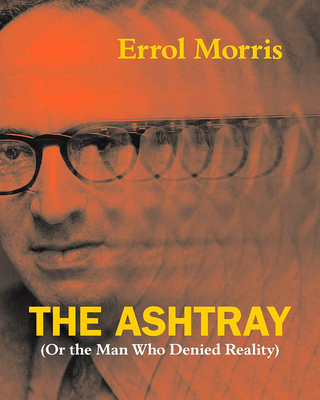 The Ashtray tells why—and in doing so, it makes a powerful case for Morris’s way of viewing the world, and the centrality to that view of a fundamental conception of the necessity of truth. “For me,” Morris writes, “truth is about the relationship between language and the world: a correspondence idea of truth.” He has no patience for philosophical systems that aim for internal coherence and disdain the world itself. Morris is after bigger game: he wants to establish as clearly as possible what we know and can say about the world, reality, history, our actions and interactions. It’s the fundamental desire that animates his filmmaking, whether he’s probing Robert McNamara about Vietnam or the oddball owner of a pet cemetery. Truth may be slippery, but that doesn’t mean we have to grease its path of escape through philosophical evasions. Rather, Morris argues powerfully, it is our duty to do everything we can to establish and support it. In a time when truth feels ever more embattled, under siege from political lies and virtual lives alike, The Ashtray is a bracing reminder of its value, delivered by a figure who has, over decades, uniquely earned our trust through his commitment to truth. No Morris fan should miss it. Errol Morris is a director of films, primarily documentaries, including The Thin Blue Line; Gates of Heaven; Fast, Cheap, and Out of Control; and The Fog of War, which won the Academy Award for Best Documentary Feature for 2003. "Oscar-winning filmmaker Morris was once a graduate student under philosopher Thomas Kuhn, author of The Structure of Scientific Revolutions, and this intimate analysis of flaws in that 1962 treatise is driven by Morris's smart, conversational tone. . . . Throughout the heady discussion, Kuhn's cantankerous personality is revealed: he once threw an ashtray at Morris, who is responding--albeit 45 years later--by lobbing this combative tome into the academic and practical world." "Many readers will know Errol Morris for his superb films that have won an Academy Award and other high honors. He has given us a book of the same quality and importance. It is a sustained argument in defense of Truth and Reality. At the same time, it is the story of a life in passionate pursuit of these vital ideas, not as distant abstractions but as things that actually exist in the world and demand our respect. It is about time! In an era of false news in our media, pseudo facts in politics, and political correctness in academe, no cause is more urgent than the cause of Truth and Reality." "A compelling send-up of contemporary relativism about truth and epistemology by the distinguished film-maker and writer Errol Morris. He bases it on his own personal interactions with Thomas Kuhn, one of its most influential practitioners. But there is a little bit of everything in the book. Interviews with philosophers and scientists are intertwined with stories from many of my own favorite authors (Lewis Carroll, Russell, Borges), and discussions of notions such as reference, natural kind, paradigm, and incommensurability. Throughout we find, as we have come to expect from him, Morris's commitment to find out the truth. This time about truth itself." "A wonderful read, combining memoir, epistemological reflection, the ethnography of academic philosophy -and confession of faith. The Ashtray will provoke and stimulate any serious reader, but it will provide particular insights for anyone familiar with Morris's important films." "Errol Morris is a remarkable documentary film maker. He pursues his craft in the conviction that there is truth to be found and that creative and determined efforts will uncover it. In this extraordinary book, Morris explores his animating philosophical commitments about truth, reality, and knowledge. He presents his outlook in sharp opposition to ideas about relativism and incommensurability that he associates with Thomas Kuhn’s profoundly influential The Structure of Scientific Revolutions. Morris's book is entertaining and engaging, but above all else it offers us a compelling exploration of the value of truth." "This book is brilliant, thought-provoking, sometimes infuriating, and nearly always convincing. Everyone interested in the fate of truth and knowledge in these postmodern, alternative fact times should read it." "Is truth real or is it a matter of opinion? That is the question Errol Morris ponders in this fascinating book. His argument for the reality of truth is compelling, informative, and lively. And there's another powerful lesson in it that goes far beyond the seemingly abstract philosophical issues: We escape the bubble of relativism precisely when we reach out to other human beings, when we care about something more than the 'little me,' when we offer the world our love--as Morris has done with his inspiring films, and now with this book."